This post is dedicated to the lovers of SAS programming language. Flaunt your knowledge in your peer group with the following SAS program 😊 It's one of the stupidest and coolest way to make simple things complex. The idea is to show off your creativity and solve easy problems with complicated ways to learn some cool tricks which can be used to solve future real complex problems. The output of the program is not shown here for surprises. Please post your output in the comment box below! 1. You can create character value with BYTE() function. The BYTE function returns character value against the specified ASCII code. Run BYTE(65) and see what it evaluates. Run the program below and see log. Result : A . The above program returns A. Similarly, you can create A to Z alphabets with the following program. See log after submitting the above code. 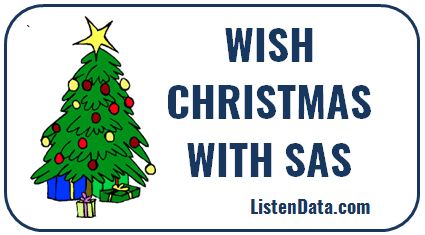 5 Responses to "Wish Christmas with SAS"
Can i have the output for "Print out the middlest observation in a dataset"? In the code below, "mydata" is your dataframe name.